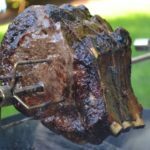 Learn how to cook spit-roasted prime rib on a grill or over an open fire with this delicious holiday recipe. Cooking prime rib on a rotisserie is fun and absolutely delicious. An open fire is a really fun way to cook spit-roasted prime rib. Cooking over a campfire adds a rich smoky flavor to the meat that is absolutely amazing. There are a couple of tricks to cooking a prime rib over an open fire. First, make sure you prepare the fire well enough ahead of time so that you have plenty of coals. Hot coals will be doing most of the cooking, not so much the fire. Second, cook with indirect heat and a drip pan. Think of it the same way you would if you were cooking with charcoal over a grill. You want enough coals to produce proper heat to cook the meat. If you want to sear the meat, use direct heat and even flame but be careful. Spit roasting prime rib on a grill is a lot easier than an open fire since you can control the heat easier since bending over a campfire for long periods of time can get tedious. The same concepts are used with a charcoal grill as you would an open fire. Use indirect heat and a drip pan and heat the grill to about 325°. 325° F should be perfect as it rotates and the juices melt into a splendid crust. Again you can use a little flame to kiss the meat if you want to ensure a good sear on the roast, but I do not think it is necessary. When I make prime rib in an oven, I usually start it off at around 475 degrees F. for the first 15 minutes to sear the meat. After 15 minutes I reduce the heat to about 325° F to roast for the remaining time. On a grill or over a fire, try to achieve about 325° F but no higher. Use a good [easyazon_link identifier=”B07477NMF4″ locale=”US” nw=”y” nf=”y” tag=”thecu0a-20″]meat thermometer[/easyazon_link] to judge doneness. I do not recommend instant-read thermometers unless you only plan to poke the meat only once. Poking all those holes in the meat just releases all those tasty juices. By cooking the meat from the start, with the thermometer in it, you can determine when it is done, only poke one hole in the roast while it is still cold, and keep as many juices intact as possible. DON’T BE A POKER! Here is a handy little chart to help you decide when to remove the roast from the heat. Remember to remove the roast about 5° before the desired doneness. As the roast rests, it will continue to cook and rise about 5 more degrees to the desired temperature. Cover the roast with foil while it rests. What do you serve with Prime Rib? I generally serve this with green bean casserole and my Garlic Caper Mashed Potatoes. I also really love Yorkshire pudding with prime rib. I have never tried Yorkshire Pudding over a fire, but I suppose it could be done with the Dutch oven. If anyone tries it, please let us know how it turns out in the comments below. My favorite vegetable to serve with beef is either broccoli, cauliflower, or asparagus. Of course, baked potatoes are always a favorite with a beef dish. On the grill, you should find a rotisserie unit that fits your brand name. Since my grill is different than yours, I can not recommend any one product. I have seen units advertised as universal, but I have not used them. For over the fire, my favorite prime rib rotisserie is this [easyazon_link identifier=”B0002GWW80″ locale=”US” tag=”thecu0a-20″]battery operated rotisserie[/easyazon_link]. It also works great for poultry and other roasts. Make sure that if you use a rotisserie to use the forks for it too. You will regret it if you don’t have a set of rotisserie forks as they keep the meat in position as it spins and cooks. This rotisserie really makes a great gift if you are looking for something for the outdoor chef in your life. Learn how to cook prime rib over an open fire with this delicious recipe and method. Prepare a fire at least an hour ahead of when you plan to start cooking the prime rib. You can also use charcoal to help aid the cooking or use a charcoal grill with a rotisserie. Make sure the fire has plenty of coals. Coat the roast liberally with the rub, cover it with plastic wrap, and let it stand at room temperature for about an hour. After an hour, remove the wrap and slide the roast to the center of the rotisserie. 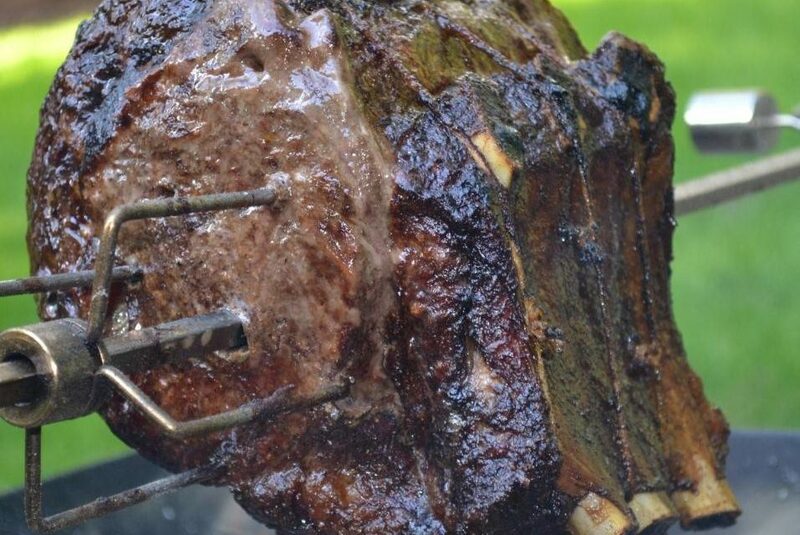 I strongly recommend that you use rotisserie forks to help hold your meat in place while it turns. If you have them, secure the roast to the rotisserie with the forks. Place the rotisserie over the fire. Place the drip pan onto the coals underneath the roast; this will provide diffused heat and reduce flare-ups from dripping grease. Try to maintain hot coals, you may need to add more firewood or charcoal as needed. Cook for 15 minutes per pound. If you desire, check the internal temperature with a meat thermometer about a half hour before it should be done to ensure that it is reaching the correct temperature for your desired doneness. Medium rare is around 130°F. Remove the roast and let rest when the roast is 5 degrees below your desired doneness. 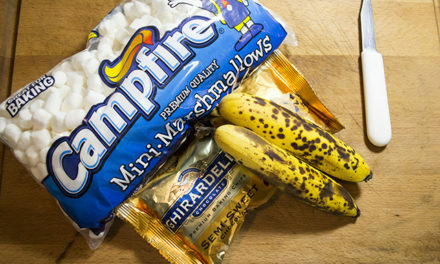 Cover with foil and let rest for about 15 minutes. The roast will continue cooking and rise about another 5 degrees as it rests. Slice and serve with your favorite side dish. Cooking time varies depending on the size of the roast. Bone in verses no bone roasts may also affect cooking times. This recipe was originally published on Nov 15, 2013. It has been updated for your enjoyment. Disclosure: Some of the links on this page may be affiliate links where we receive a small commission if you buy from them. This helps us to offset some of the cost of operating this website and continue providing great recipes. Amazing, and fun to cook too. Found the picture on a google search while looking for ideas on setting up for outdoor cooking. Talk about incentive! I’ll be christening my new outdoor kitchen with a rib roast. Let us know how yours turns out. This is my favorite way to cook a roast. Smokey and delicious. Holy Moly! That looks really good! Man I really want to try this! If you try it, let us know how it turned out. Have you ever tried brining the roast? I wonder how that would turn out?